#5 NORTH CAROLINA 82, Texas (Longhorns, 38,463 students, Austin, TX) 63 -- Harrison Barnes hadn’t cracked double figures for two straight games while North Carolina’s performances ranged from flat to disinterested against overmatched opponents. On Wednesday night, against a team that had beaten them the past two years, the fifth-ranked Tar Heels displayed the talented, fast-paced and—most importantly—focused form that everyone expected this season. Barnes scored a season-high 26 points to help North Carolina beat Texas for its fifth straight win. The Tar Heels (11-2) avenged last season’s last-second loss to the Longhorns in their last major non-conference game before opening ACC play against Boston College on Jan. 7. WAKE FOREST 87, UNC Wilmington (Seahawks, 11,743 students, Wilmington, NC) 78 -- C.J. Harris scored 23 points and six Wake Forest players reached double figures in a victory against UNC Wilmington on Wednesday night. Tony Chennault added 15 points for the Demon Deacons (8-4). They let an 11-point lead slip away in the second half before holding UNC Wilmington without a field goal for nearly 5 minutes as part of their 21-6 run. Freshman Adam Smith had season highs of 32 points and seven 3-pointers, and Keith Rendleman added 14 points and 10 rebounds for the Seahawks (3-7). BOSTON COLLEGE 83, Sacred Heart (Pioneers, 4,192 students, Fairfield, CT) 73 -- Junior Matt Humphrey scored a career-high 18 points to lead Boston College past Sacred Heart Wednesday night in front of 2,263 fans at Conte Forum. Humphrey went 5-for-10 from the field and 5-for-7 from the foul line. Freshman Dennis Clifford also scored a career high with 16 points and had six rebounds and three blocks. He was 6-for-7 from the floor. Freshman Ryan Anderson had 13 points and seven boards, and classmate Lonnie Jackson scored 12 points, all in the second half. 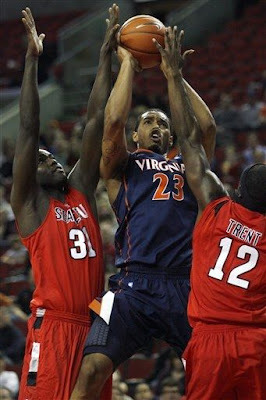 VIRGINIA 83, Seattle (Redhawks, 7,900 students, Seattle, WA) 77 -- Senior forward Mike Scott scored a career-high 33 points and grabbed 14 rebounds to lead the No. 24 Virginia men's basketball team to an 83-77 victory over Seattle University Wednesday night (Dec. 21). It was the second game of a two-game road trip to the Pacific Northwest for the Cavaliers. UVa opened the trip with a 67-54 win at Oregon on Sunday (Dec. 18). The victory was the eighth in a row for the Cavaliers and improved their record to 10-1 on the season. It was the sixth consecutive loss for the Redhawks who now have a record of 2-8. 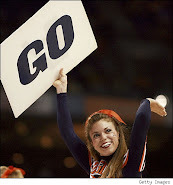 The game marked the first time this season a UVa opponent scored more than 58 points.